The one thing no-one talks about when someone wants to make comics is the cost behind their creation. Part of the mystery is that solo creators don’t need to pay someone else to work on their books, and part of it is that some people team up with undisclosed profit shares at the start of a project. Once the average cost of a creator in a particular field becomes known, it’s easier to work out how to budget for finishing a book – though you’re always better getting a specific creator’s rate. After seeing a few too many people work out the cost of putting together a book using the calculator on their phone, or a scrap of paper, using numbers they had for other creators, I settled on making a tool for myself that I could update once I had the page rates of the creators I wanted to work with. 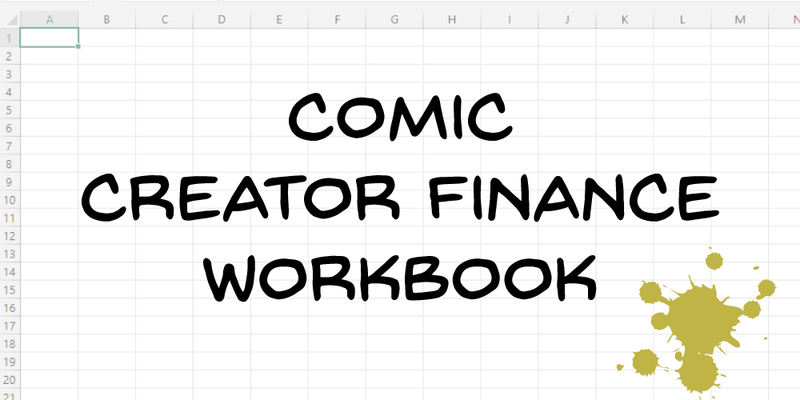 Out of that came the Comic Creator Finance Workbook – a tool with an unimaginative name that sheds a light on the finances behind making comics and attending conventions, across six sheets. All of this comes as I get ready to launch issue one of a comic I work on with Gareth Luby. There are two parts to this one that work together. The first part calculates the cost of paying creators to work on your comic. Enter the page rate at the top of the sheet, and the rates in their respective boxes, and it works out the total. That’s the scary number. The second part works out the profit of a print run based on your quote from a printer and the retail price of your book. Combined, the calculator works out a figure for how many copies you need to sell to cover your production costs – though thinking of print runs in blocks, rather than individual copies, helps avoid any confusion over when you’re in the black. Earlier, I mentioned profit sharing. Here’s where we get to it. I made this page to work on manual entries of profits, rather than using the figures from the last spreadsheet. The reason for this is twofold. Firstly, you can still manually input those numbers. Secondly, I don’t want to guess at the many possible combinations of payment-and-profits that creators can establish for themselves. Entering the agreed upon percentages along with profits earned will split the earnings up as needed, as well as adding the totals up as a fact checker. A year before I made the Workbook, a shop asked me about stocking some comics I had worked on with Gareth Luby. I had a couple of problems with the question that meant I couldn’t do it. One was not knowing what our cost per book was off the top of my head, which fed into the other issue: I didn’t know if we would make any profit from the proposal. For all I knew, we would make a loss on it. So, I made a calculator for it. Informed decisions are the best decisions when it comes to where to stock your book. Keep in mind that though this will help you figure out the money-side of things, there are other pros and cons that need to be weighed up as well (exposure vs having stock for a convention next weekend, for example). The numbers are just a good starting point. This sheet was one of my favourites, because there are so many times I’ve been left wondering if an event was even worth it in terms of sales. It’s fairly simple: enter the individual items, and the sheet will total them up. There’s a whole section to add up your travel costs, which can grow without you paying attention. This doesn’t include stock, because that can be carried over from one event into the next, but it looks to cover as much ground for individual events as it can. My example on the spreadsheet adds up to an expensive weekend – though I know the cost of trading is rising all the time, and varies from country to country. A big thanks has to go out to Steven Andrews for this recommendation, when I was still putting the Workbook together. There are some simple things to enter before and after each event, though some set-up can be done for every event in one sitting – stock names and quantities, individual prices, and the prices when sold in a deal. After an event, inputting the amount of stock sold will tell you how much you have left, and how much each item or product type made you. Steven’s suggestion for this was to see what stock sells best at a particular event, but it can also help you figure out if something isn’t worth the space on the table (and in your bags!). After that, the sheet uses your income for the convention and compares it to the cost you calculated on sheet 4, and tells you in simple terms whether you made a profit or not. My big piece of advice for people who download the spreadsheet is to save a blank copy as a backup, and then begin personalising it for their own needs. I broke my own Workbook to use just two pages for Meouch #1, so I could track the costs of paying creators and work out how many copies myself and Gareth need to sell to earn back our money, and work out profits from comic shops that we’ll be approaching to stock the book after its launch. With a big project to push, Part 2 of the Workbook will help me track my progress over several events, to see which is a good fit for the sort of stories I tell, and which events aren’t worth selling at again. 2. Ask me questions if there’s a way the Workbook isn’t helping you. If you would like to leave a tip for putting together this blog and workbook, you can head over to Ko-fi to show your support.